Okay, raise your hand if you DON’T love watching HGTV, Chip and Joanna, and all the other shows about taking an out-of-date home and then turning it into a gem using reclaimed materials. It seems the American viewer loves the transformational process of re-purposing what was left to rot and then making it useful again. Well, this story as a little bit of that element mixed in with building a new custom home for a client that didn’t want to go to the store to pick out everything and leave family history sitting in a dusty old barn. Many custom homes being built today are mixing old with new. 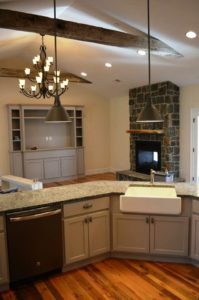 For instance, farmhouse sinks and barn doors with exposed iron hardware are often found in kitchens that also feature granite counter tops and stainless appliances. That granite might also be found in the bathroom, illuminated by fashionable light fixtures, which also cast light on the once-, and once-again, popular subway tile in the shower unit. 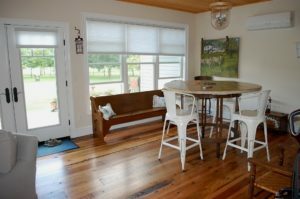 Reclaimed materials are now commonplace in new construction. These materials are sometimes family heirlooms that, at the time, resemble something you might see pulled from an old shed on an episode of American Pickers. Mt. 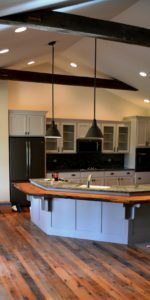 Tabor Builders designer Royce Eby was recently issued a great challenge of using old wood planks, barn doors and a large wood beam stored away for many years on a family farm. “It is one of the neatest projects I’ve ever worked on,” said Eby, who used a 3-D modeling program to show exactly how the craftsman-style, single-level home would look with the re-discovered family artifacts. 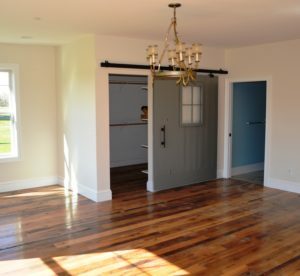 The wood planks were finely finished and used as flooring; the barn door is in the kitchen and the large beam is a counter top. Using reclaimed materials is becoming more and more popular, perhaps because of the current building trends mentioned above. The Miles project was the second such one for the Mt. Tabor team. The owners of Buddy Lou’s Restaurant hired the team to remodel the Hancock, MD destination and build an outdoor dining area. The owners used many antique items, such as a canoe, bicycle and barn beams, to give the eatery a “throw-back” feeling for guests. Royce said that in doing such projects, he now has a local resource for people, wanting to incorporate historic pieces in the design, who don’t actually have such materials. The Miles project was special in more ways than just using pieces of family history from buildings on the farm. 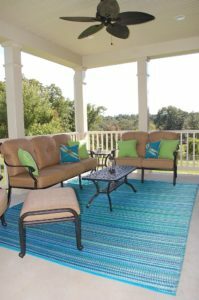 Due to Dale’s battle with Parkinson’s, the couple wanted to build a home that could accommodate his needs as the physical challenges progress with the disease. Since the designers at Mt. Tabor have built a number of “aging-in-place” style homes, they were able to make the needed adjustments – ramps; level floor surfaces; expanded hallways; appliances and storage designed for the physically-challenged; etc.… — with the future in mind. The room overlooks the recently-sold family farm. The couple, still quite active in operating their transportation business – Road Runner Services – is looking forward to sitting and enjoying the views of the Clear Spring landscape for many years to come. 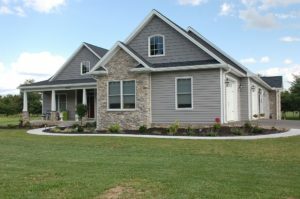 If you have some “crazy ideas” that you may want to incorporate in your new home or would like to find out more about the aging-in-place building concept, contact the Mt. Tabor office through here or call the Clear Spring, MD office at 301-766-7161 to set a meeting.